The core countries of East Asia are also the core of Northeast Asia, which is a broader region. The term Northeast Asia was popularized during the 1930s by the American historian and political scientist Robert Kerner. Under Kerner's definition, "Northeast Asia" included the Mongolian Plateau, the Manchurian Plain, the Korean Peninsula and the mountainous regions of the Russian Far East, stretching from Lena River in the west to the Pacific Ocean in the east. The definition of Northeast Asia is not static but often changes according to the context in which it is discussed. In common usage, the term Northeast Asia typically refers to a region including China. In this sense, the core countries constituting Northeast Asia are China, Japan, Mongolia, North Korea, Russia, and South Korea. Broader definitions, such as that used by the World Bank refer to the "three major Northeast Asian economies, i.e. China, Japan, and South Korea", as well as Mongolia, North Korea, the Russian Far East and Siberia. The Council on Foreign Relations includes the Russia Far East, Mongolia, and Nepal. The World Bank also acknowledges the roles of sub-national or de facto states, such as Hong Kong, Macau, and Taiwan. The Economic Research Institute for Northeast Asia defines the region as "China, Japan, the Koreas, Nepal, Mongolia, and eastern regions of the Russian Federation". Russia is often included in discussion of the region because its interests and policies interact with those, in particular, of China, Japan, and the Koreas. The Yellow Sea, the Sea of Okhotsk, and the East China Sea are included in discussions of the region. 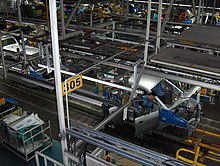 Northeast Asia is one of the most important economic regions of the world. It is also one of the major political centers and has significant influence on the international affairs. By the end of the 1990s, Northeast Asia had a share of 12% of global energy consumption, with a strong trend. By 2030 the strong economic growth in the region is expected to double or triple this share. 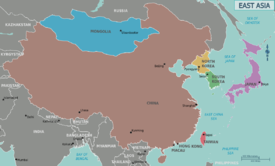 In biogeography, Northeast Asia generally refers to roughly the area spanning Japan, the Korean Peninsula, Northeast China, and the Russian Far East between Lake Baikal in Central Siberia and the Pacific Ocean. Northeast Asia is mainly covered with temperate forest and grassland. There is a vast contrast with temperatures between summer and winter. It is also a mountainous area. ^ Narangoa 2014, p. 2. ^ "Northeast Asia." Council on Foreign Relations. Retrieved on August 10, 2009.